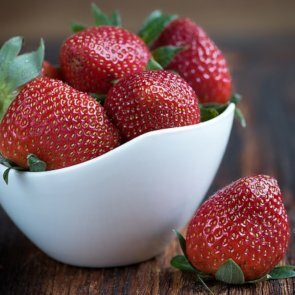 Strawberry is a rich source of vitamins, enzymes and organic acids. Suitable for all skin types, this ingredient gently exfoliates dead skin cells, cleanses and tightens the pores, and gives a healthy and glowing complexion. To make this simple strawberry mask, mix ¼ cup of mashed strawberries with 1 tbsp of rice flour and 3 tbsp plain (unsweetened and unflavored) yogurt. When the mixture is well-blended, apply it evenly to your face and let it sit for 20 minutes. Rinse with cool water and apply moisturizer. This mask helps get rid of acne, acne scars and blemishes. It contains honey that provides the skin with nutrients and produces a revitalizing effect, and ground spices that have exfoliating properties. Together, these ingredients improve microcirculation and kill harmful microbes that live on the skin surface. Mix equal amounts of honey, ground nutmeg and ground cinnamon until you get a thick, brown paste. Apply it to your face and leave it like that for half an hour. After that, rinse with cool water and moisturize. The mask is made with mango, avocado and olive oil. Each of these ingredients contains tons of nutrients (fatty acids, vitamins, minerals, enzymes, antioxidants, organic acids) that your skin needs. Combined, they will leave your skin soft and supple, calm down inflammation, prevent dry and flaky skin. Mash the flesh of one ripe mango with a fork. Add 2 tbsp of mashed avocado, 2 tbsp of honey and 2 tbsp of olive oil. Stir well until you obtain a lump-free, uniform mixture. Apply it to your face, leave it for about 20 minutes and then wash your face with lukewarm water. Blackheads appear on the skin when your pores are clogged with sebum (skin oil). This mask unclogs and tightens the pores, exfoliates dead skin cells, and helps prevent acne scars thanks to the lightening properties of lemon juice. To make the mask, simply mix one egg white with 1 tbsp of lemon juice (preferably freshly squeezed). Leave the mask for 20 minutes and then rinse. Due to the tightening effect of egg white, this mask can be a bit drying. If your skin is prone to dryness, you can substitute yogurt for egg whites. Mix some plain yogurt with 1 tbsp of freshly squeezed lemon juice and apply the mixture to the problem areas, using a cotton ball. Let the mask sit for 30 minutes and then remove it with cool water. This mask resembles a healthy dessert, but it is actually a great revitalizing and nourishing treatment for teen skin. Banana moisturizes and nourishes the skin, citrus juice improves complexion, and honey is an antimicrobial agent that combats acne-causing bacteria. To make this mask, mash a ripe banana with a fork. Add 1 tbsp of honey and a few drops of lemon or orange juice. Mix all the ingredients together until well-blended. Apply the mixture to your face, leave it for 15 minutes, then wash your face with cool water. Bubbly masks aren’t just effective, they’re also very fun to use. And very few people know that you can make such masks yourself instead of spending money on expensive Korean products. This mask contains only two ingredients, bentonite clay and apple cider vinegar. It is perfect for taking care of oily and acne-prone skin; the mask helps get rid of dirt, impurities and bacteria, making the skin smooth and acne-free. Combine 1 tbsp of bentonite clay and 2 tbsp of apple cider vinegar in a plastic bowl and mix with a plastic or wooden spoon. Apply the mixture to your skin and leave it on for about 15 minutes or until it starts to harden. Remove with a soft, wet washcloth and apply your favorite moisturizer.